Tanya and I heard for weeks after we joined Second Life about Hair Fair last year. Naturally, we jumped into this year’s event as soon as we could. First. we’re both in love with Starley’s new textures. This from the duo who made the rule that the same hair designer can never have both good blond and good brunette shades. My favorite is Caramel (also a rl favorite). I love it so much I’m going long, and pigtails with Annie May. I think it’s the bangs, they are so cute. The first short hair release may send me into the stratosphere. Next is Annie May III. I think it’s supposed to look like a hot asian girl but I just feel like a panda. Still with the cute bangs. Short again. This is Electric in Sand. The boy hair from Gurl6’s freebie bag. But it’s cute and short in a “just tumbled on the beach” sort of way. I squee’d when I saw new Rita Groshomme hair. She was my first favorite hair designer. She has a new brand “Curio” and a new style, kind of goth/punk. This is Creepy. No really, that’s the name of the hair, in Ash Blond. Ginny came out with a Girl Next Door line at Last Call. I really fell in love with this outfit. I applaud the creator of this jacket. It’s not pink (or even purple) It seems pink dominates RFL items. I had thought that purple would be the color this year, but pink is still a big color. Find the Highwayman jacket here at Callatropia. Come down to L’elfe Blanc, and buy ANY purple dress for 100L and 50% of the cost of the dress will be donated to the Groovy Kinda Quest Relay for Life Team. Get pretty clothes and support the American Cancer Society. In this photo, Hair and Outfit are this year’s RFL items. Skin was from last year’s RFL. I was just sitting in my Photosphere working on some photos to show you why my Linden balance was shot when I got an IM from Aleri Darkes. She had read the post where I had complained about the lack of good dark brunette textures. Hers is just a little off in shading and a tad too shiney. Probably the ones I hate the worst (which irritates me to no end because I love her prim work) is Gurl 6. I’ve actually considered buying ETD’s old texture set she has for sell and redoing all my Gurl 6 hair with those textures. But alas I digress from the story to the rant again. Aleri sent me the Cheer hairstyle in some new textures that she’s working on to ask for my feedback. I absolutely LOVE the midnight. I don’t normally fall that in love with a black texture, but I did with this one. And the sable is gorgeous. It’s a dark brown with subtle shading. Hopefully these will be release before too long with her hair releases. She also does the release of demo hairs when she does her FashCon packages. I LOVE this idea, Aleri. I’m sitting in my own little neck of the woods going through the textures of releases when I get to hers I unpack it. It’s got demos of her releases. I just try them on in the comfort of my own quiet little pad, pick the styles that suit me before going to the store to purchase it. This is the ult! BTW the Photosphere is usable by ALL. Please donate somewhere to RFL if you use it! That’s all I ask. Now I return you to my digging through my inventory and creating my “Paperdoll” cause I’m out of L$ & the system won’t let me purchase any. 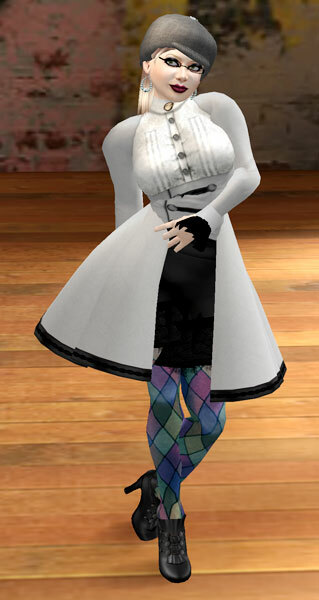 You are currently browsing the Six Kennedy – Gurl 6 category at SL Fashion Notes.